Most people have jumped the gun. I did too – prepared to vent my indignation. I went to take a look on Saturday, the day the picture was put back. The removal was a part of another project specifically planned to provoke discussion. The #MeToo and #TimesUp were the context, not the reason. 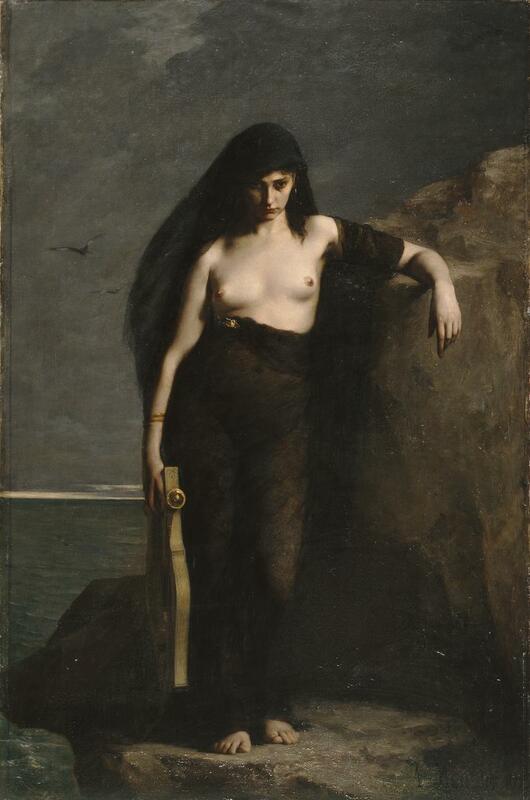 Opposite the Nymphs picture is Sappho, by Charles Mengin – supposedly one of the most alluring images of the female body. And I have to say that’s not too far off the mark. And there are other provocative representations of naked and part naked women around the gallery. To be honest, they seemed as thrilled by the negative responses as much as the positive. It might be worth noting the deep love of art that would be a natural part of a curator’s persona: the human body, which they may well have been exposed to in the flesh while studying. I don’t think we’re dealing with 3rd wave feminist prudes here (though I know nothing more about the curator or artist that were involved in the event). The other charge was that it was a publicity stunt. Again, he said that had they intended that, there are a number of things they would have done differently … and would have been better prepared … which brings us to the post cards: it seems they sold out, so much was the demand. They were not removed, as many have claimed. I had conversations with some other visitors there, those that, like me, saw it as censorship initially … they too were changing their minds. And as far as the stated intent, it worked well. On Saturday the picture was put back, and the post-it notes left in place. And the outrage on display (again, of which I might have been a willing contributor) was as visceral as any that we might accuse SJWs of engaging in. So, given the pre-planned project by the artist Sonia Boyce ( #MAGSoniaBoyce ), I’ll give the benefit of any remaining doubt to those who run my favourite local gallery. There are a lot of perspectives on these movements, and a lot of heated outrage, rather then healthy, if heated, debate.